TRAP DESCRIPTION: Bodygrip traps are the traditional body crushing trap used by professional trappers. 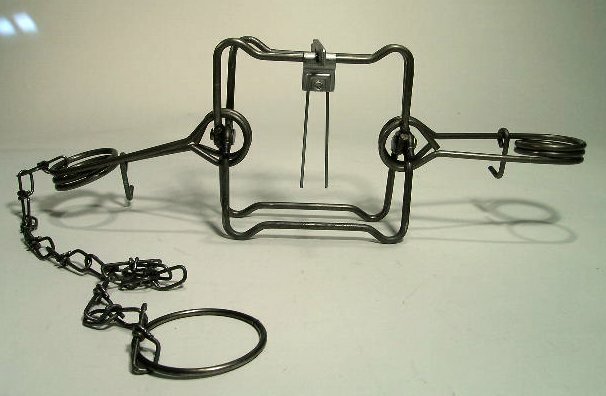 These traps are square, heavy steel traps which have two springs designed to hold strong animals. They come in different sizes, this one is the 120 double spring. Unlike the coil traps these bodygrip traps are actually kill traps. 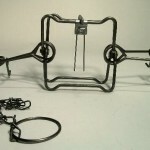 WHERE TO USE IT: Body Grip traps can be used on any nuisance wildlife and are only limited by your imagination when it comes to making a successful set. Comments on BODY GRIP 120 5" X 5"
What is the price of 10 quantity of body grip 120 traps with shipping cost to Sweden? You'll need to use our cart to get the shipping cost which quotes everything "real time". Here's how. If you look to the right side on this page (just up a little bit above this comment), you'll see the "add to international shopping cart" button. Just click it and one trap will be added to your cart. Now if you click the "international shopping cart" link up at the top of the page, you'll proceed to the checkout section of our international cart. There you can change the quantity from 1 to 12 and then choose your country and our cart will show various shipping options. All of this will be done before you add any personal information so you it will be way before you'd be completing the order so there will no personal data entered other than your ship to country.